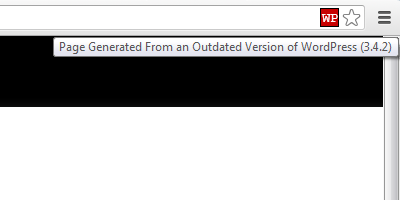 Meta Generator Version Check is a web browser extension that checks the meta generator tag, that is sometimes placed in web pages, to see if it the web page is generated from an outdated version of web software. It is available for Chrome. If you see that we are missing a check for software that provides a meta generator tag with version information please let us know so that we can include that in the extension. The extension is localized for the following languages: Arabic, Bulgarian, Catalan, Chinese (Simplified), Chinese (Traditional), Czech, Danish, Dutch, Finish, French, German, Greek, Hebrew, Hindi, Hungarian, Indonesian, Italian, Japanese, Korean, Norwegian (Bokmål), Persian, Polish, Portuguese, Romanian, Russian, Serbian, Slovak, Spanish, Swedish, Thai, Turkish, Ukrainian, and Vietnamese.